Ranbir Kapoor has played Sanjay Dutt from the Nineties to the present in Rajkumar Hirani's upcoming biopic drama Sanju. 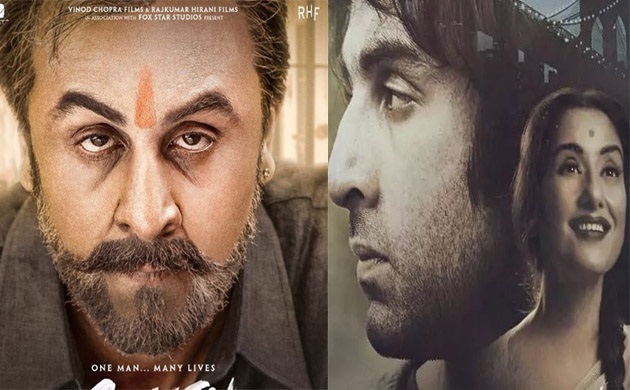 While fans can't stop gushing over Ranbir's unbelievable transformation into Dutt, the latest poster from the much-awaited flick is taking the internet by storm. Earlier, Ranbir's convincing look as Sanjay Dutt has managed to create anticipation among movie buffs and now its Manisha Koirala, whose striking resemblance to Dutt's mother Nargis, has made the social media going bonkers. Director Hirani on Wednesday took to Twitter and shared a new poster of Sanju which showcases Koirala as Nargis with all her glory. "She lovingly called him Sanju, and now that’s what we all do too! Watch the ever so wonderful Manisha Koirala as Nargisji on 29th June," Hirani captioned the picture. Now let's have a look at all the Sanju posters, which presented Sonam Kapoor, Anushka Sharma and Paresh Rawal in one of their most eye-catchy avatars till the time. In the very first poster, the Ae Dil Hai Mushkil actor portraits Sanjay Dutt from a time, when he was released from Pune’s Yerwada Jail in 2016. The second one will give you all retro feels and pique your interest for Sanju. Rajkumar Hirani has given a glimpse of the crazy and romantic life of Sanjay Dutt through the poster. Interestingly, Ranbir Kapoor in Sanju's teaser mentioned that a young Sanjay Dutt had 308 girlfriends and we definitely know now that Sonam Kapoor is playing one of them. The third poster from Sanju features a shaken Sanjay Dutt being comforted by father Sunil Dutt portrayed by Paresh Rawal. Ranbir Kapoor is seen vulnerable while there is a visible worry on Paresh Rawal's face. Giving us an insight into the memory of the 80s, the poster speaks volumes about the father-son bond shared by the yesteryear actor Sanjay Dutt with veteran actor and father Sunil Dutt. Though confusions still prevails over Anushka Sharma's character in Sanju, she worked on every nuance of the role for days. In this poster the Pari actress looks different with her curly hair and shares a close association with her character in another Rajkumar Hirani directorial PK.